Well. Hello! I’ve missed you. I’ve spent the last two years working in animal rescue, but it’s time to dust off the blog and get back in the kitchen. Today I have a super simple but delicious appetizer to share with you. It’s very nearly September and I am desperately clinging to the last gasps of summer. This might just be my favorite time of year; farmer’s markets are overflowing and I fall in love with ingredients I’ve taken for granted all over again. Case in point: the tomato. This recipe was made for the late-summer haul of juicy, sweet, perfect tomatoes. Use tomatoes worthy of a spotlight. 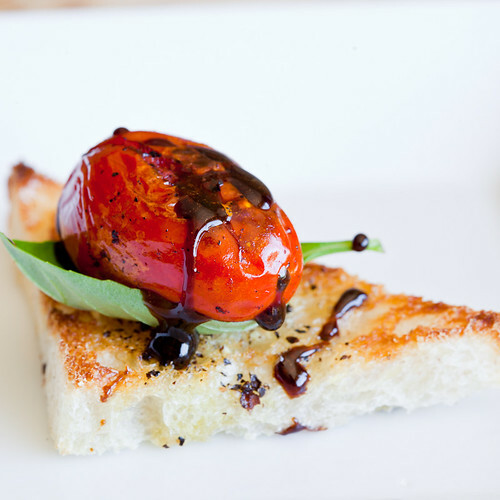 If you happen to be growing your own grape tomatoes (and your own basil!) than this has got your name all over it. It’s quick to prepare and tastes great at room temperature, so you can make a bunch and let your dinner party guests enjoy them at their leisure. Perhaps on a deck with a nice bottle of red? I don’t have a deck, and didn’t throw a party, so I won’t tell if you just make these for yourself as a light snack on a weekend afternoon. They are so easy you can absolutely make them without an occasion. Start off by preparing the crostini. Arrange your oven racks so you have one at the very top and set your oven to Broil. 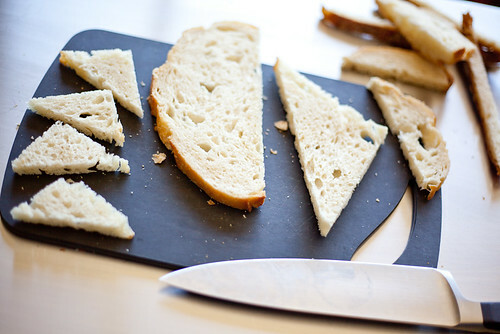 Slice the sourdough into bite-sized triangles. I like to cut the bottom crust off with a long chef’s knife (helps you get a nice clean edge) and create one big triangle. Slice that in half for two triangles, and each of those in half again. 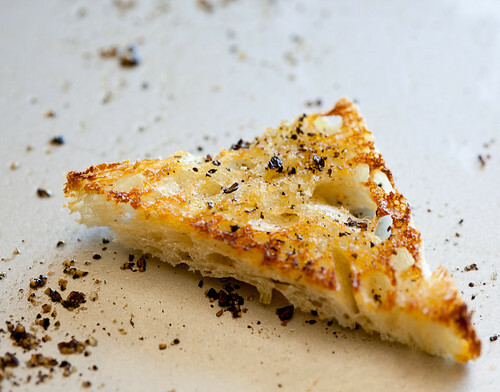 Each piece of bread should give you 4 small triangles. You can save the scraps to make your own breadcrumbs, or toss them to the birds. 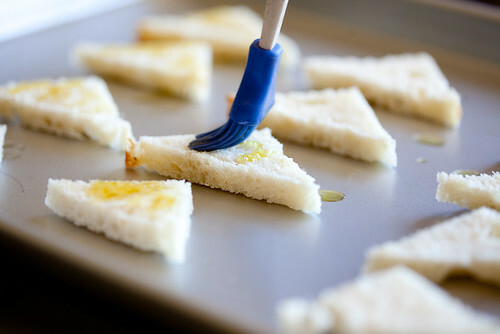 Arrange the bread on a baking sheet and brush lightly on one side with olive oil. 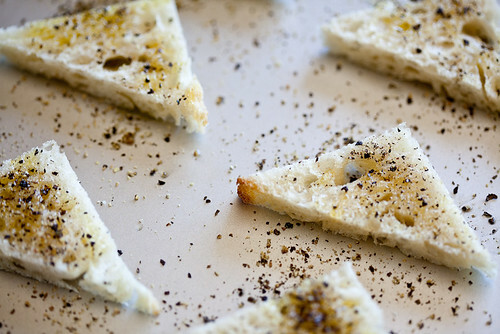 Season generously with sea salt and fresh cracked black pepper. I like to go a little crazy with the black pepper, but if you don’t like its signature heat, you can ease up on it. Broil for 2-4 minutes (watching constantly) until perfectly golden. Remove from oven and set aside. Do not walk away from these while they are in the oven or they will burn up! Now grab your cast-iron skillet and put it over high heat, very lightly oiled. 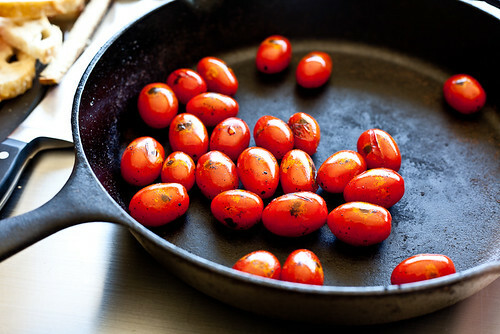 You can make the tomatoes in a regular pan if you don’t have cast-iron, but a cast-iron pan is perfect for this application. Once the pan starts to smoke, add the tomatoes. Every 10 seconds or so, gently shake the pan to toss the tomatoes around. We are looking to char the skin a little while only lightly cooking the tomatoes. Meanwhile, if you need to make your own balsamic glaze, add 1 cup of balsamic vinegar to a small sauce pot and bring to a boil. Reduce about 75%, until it becomes a thick glaze, being careful not to burn. Set aside when done. This takes about 10 minutes or less. 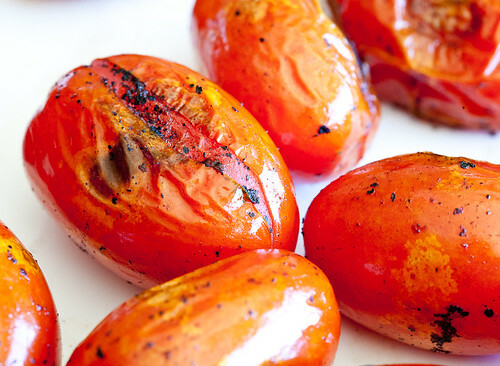 The tomatoes are done when the skin is speckled with black char and begins to split. You are not making tomato sauce, so don’t overcook them until they are mushy. We want quick cooking over very high heat (about 5 minutes total) to add flavor but to keep the individual tomatoes whole. 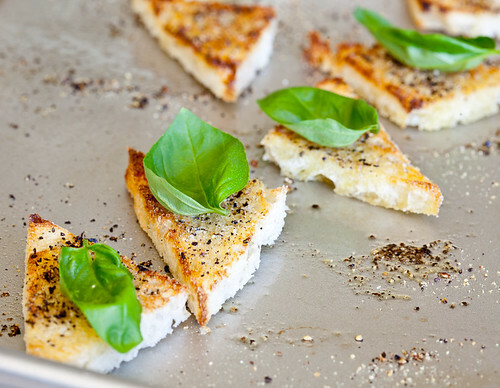 Once all your ingredients are ready, begin assembly by placing a single basil leaf on each piece of crostini. I like to flip the leaf inside out to create a little boat for the tomato to sit in. 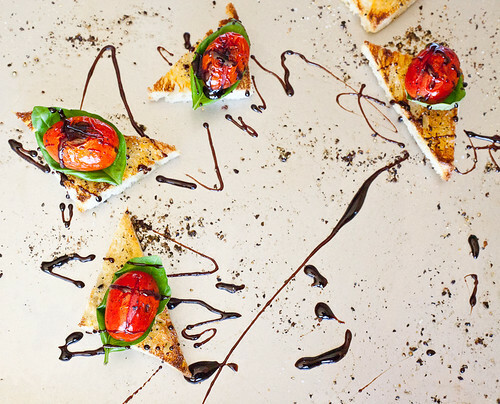 Top each piece with a single tomato and drizzle the balsamic glaze over the top. If you did not salt the bread enough before baking, you may wish to add a little pinch of salt over the top, but taste it first to be sure! That’s it! If you happen to have leftover tomatoes, they would be a wonderful addition to just about any recipe. I think they would be killer in pasta or chopped up as a salsa base. I am so glad you’re back! I use your book every week in my meal planning and have given it as a gift numerous times to friends. It’s my favorite. Oh My Goshhhhhhhhh!!!!! I only just realized that you’re back! Welcome back!!!!!! So glad to see you’re blogging again. Thank effing god you’re back! This is the best news I’ve heard in a long time! What a beautiful treat to the eyes and taste buds too. I am going to make it today. I happened to come across your blog two months back and was very sad to see that there were no recent posts and today I thought of checking it again for a vegan cake recipe and what I see…”you are back” Couldn’t have been happier. Thanks a lot for the wonderful blog you have. Thanks a lot for the wonderful blog. as a newbie veganite, I was pleased with your prior posts and look forward to more. I know it is a lot of work to do this and thank you for all your effort. I missed you a lot! And was really said to think that you left your very creative site behind. So, very happy to see you again :-)) All the best for you and also your loving ones. These look incredible! 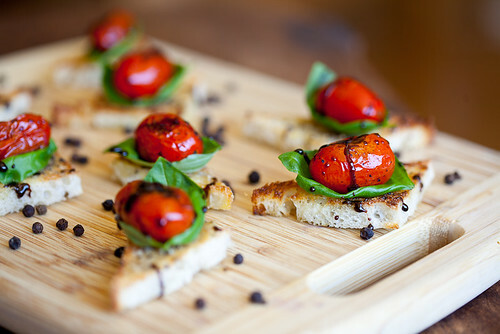 They remind me of bruschetta with a slightly different twist. I can’t wait to try the recipe. I’m so freaking excited you’re back!!!! I just randomly decided to check your blog for upcoming thanksgiving meal planning, and I was more than pleasantly surprised to see that you had new posts. Don’t leave us again…at least anytime soon. Yayayayayayaay! So glad you are back! 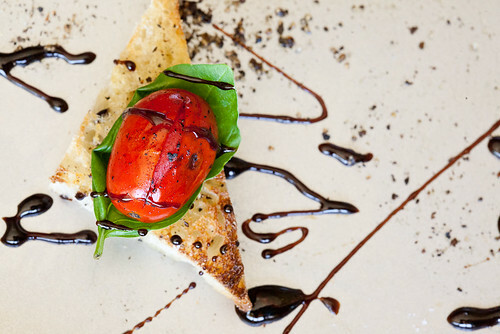 Brilliant idea to put the roasted tomatoes in an inside-out basil leaf! I am starting basil seeds under lights very shortly (for the winter indoor herb garden), and the only fresh tomatoes worth spending ANY money on in the winter are cherry tomatoes- and even then, it’s a crapshoot. Canapes for Christmas, perhaps? Oh my god!! Im SO glad you are back! Missed you!